To millions across the U.S. and around the globe, during the ‘30s Babe Ruth WAS baseball. An entire generation had grown up listening to his heroics on the radio, as he terrorized pitchers batting for the Red Sox and then for The New York Yankees. So it was only fitting that he hit the first home run in an All-Star Game history, at Chicago's Comiskey Park in 1933. "He was a circus, a play and a movie, all rolled into one," said teammate Lefty Gomez. "Kids adored him, Men idolized him. Women loved him. There was something about him that made him great." Babe Ruth was more than a great baseball player, he was an American hero who became a legend and an icon. Long after his last home run, his name has come to signify greatness and strength. Ruth was 90% efficient compared with a human average of 60 per cent. Ruth’s eyes were about 12% faster than those of the average human being. Ruth’s ears functioned at least 10 per cent faster than those of the ordinary man. Ruth’s nerves were steadier than those of 499 out of 500 persons. That in attention and quickness of perception he rated 150% of human average. When Babe Ruth hit 60 home runs in 1927, he hit 14% of all home runs in his league that year. For a player to hit 14% of all home runs today, he would have to hit over 300 home runs in one season. : Three home runs in a World Series game twice... 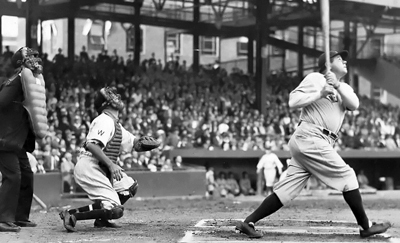 The Babe hit 340 solo home runs, 252 two-run shots, and 98 three-run taters. He also slugged 16 Grand Slams... 51% of his homers came with a man or men on base... He hit 16 homers in extra-innings, 10 inside-the-park variety, and one as a pinch-hitter (in 1916 with the Red Sox)... 459 of his career regular season homers came against right-handed pitchers, or 64%. 219 times he blasted a circuit blow off a lefty... In six seasons with the Red Sox he hit 49 homers, 11 in Fenway Park, 38 on the road. With the Yankees in 15 seasons, he slugged 659 long blows, 334 at home, 325 on the road... Ruth hit at least one home run in 12 different ballparks... 72 times, Ruth slugged a pair of homers in a game, a major league record that still stands. He connected for three homers on May 21, 1930, with New York, and with the Braves on May 25, 1935, including the final homer of his career, off Pirate Guy Bush... His 686 home runs as an outfielder are the most by any player at any position. He hit 15 long balls as a pitcher... Collected RBI in 11 consecutive games in 1931... Stole home 10 times... Won two legs of the Triple Crown seven times (1919, 1920-1921, 1923-1924, 1926, 1928)... First player to hit three home runs in a single game in the AL and NL... 11 consecutive games with at least one extra-base hit (August 28 to September 8, 1921) the second longest streak in major league history... Holds the all-time single season record for most total bases (457 in 1921) and times reached base (375 in 1923)... Three times he had 4 extra-base hits in a game... Ruth had six five-hit games in his career... Scored five runs in a game twice... On April 20, 1926, he drove in eight runs, his career high... Collected more RBI than games played in six seasons. (1921-27-29-30-31-32).